28 Feb New Pastor in Williamston, Mich.
David Gregg has been named supply pastor of Lighthouse UB church in Williamston, Mich., effective February 1, 2012. Since 2000, he had been on staff with First Baptist church in Williamston, with whom he was ordained in 2003. He and his wife, Wendy, has four children ranging in age from 19 to 23. Huntington University is seeking submissions for its first annual Fandana Film Festival on August 10-11, 2012. “Best of Category,” with prizes of $300 each. “Best of Fest,” with a prize of $500. The winners will also have their films shown on the main stage jumbotron in front of thousands during the Fandana Festival weekend. The deadline for submissions is June 1. The submission fee is $25. A late registration fee of $35 is available through July 1. Huntington’s hit music, art and film festival, Fandana Festival, is returning this year on Aug. 10-11, featuring Christian recording artist Chris Tomlin and more than 50 bands on multiple stages. Mary Mentzer, 94, passed away January 31, 2012, at a nursing home in Carlisle, Pa. She was the wife of Rev. Fred Mentzer, who passed away in 1979; and the mother of Rev. Robert Mentzer, a retired UB minister. Funeral services were held February 3, 2012 in Chambersburg, Pa., with Rev Murray Stevens, senior pastor of St. James UB church (Chambersburg) officiating. Huntington University is launching a new innovative bachelor’s degree program in heuristics this fall. Heuristics is the practice of discovery, understanding, and problem solving. The program’s goal is to develop key cognitive skills for students entering a 21st century workforce, particularly improving creativity, critical thinking, collaboration, and communication skills. The courses will be project-based and rely significantly on partnerships within the community. The Bachelor of Arts in Heuristics, Design, and Technology degree also aims to build on New Tech Network programs, which are becoming increasingly popular in area high schools. New Tech Network schools teach students to think critically and to collaborate. “Economic Development and Community Sustainability,” which will explore the tensions between those two subjects by bringing together perspectives from business, environmental science, and public policy. “Visualizing Complexity,” which is about learning to tell stories with data through a visual language. For more information, visit huntington.edu/heuristics. 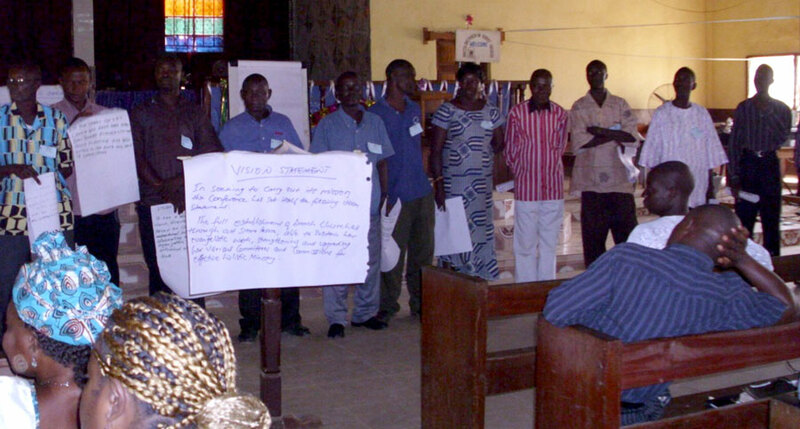 Sierra Leone Conference held a planning retreat February 1-4, 2012, in Bo. Over 150 people participated, representing churches and groups throughout the country. Bishop John Pessima says the final report is still being finalized. This is a conference for UB ministers working in staff positions with music and worship. The organizers have a goal of 8-12 people. The sessions will include “planned conversations,” where participants learn from each other. As opposed to having a particular speaker. Further information will be posted on the UB website as available. 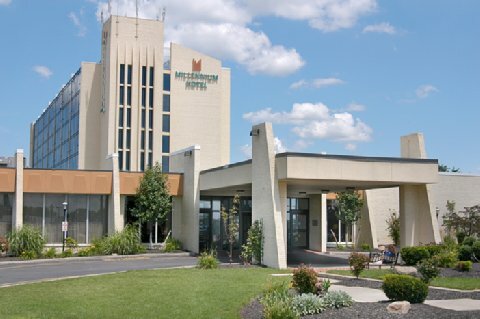 The Millennium Hotel in Buffalo, NY, where attendees will be staying. We are holding a four-day conference for ministry staff in United Brethren churches. This includes persons working in such staff roles as pastoral care, assimilation, adult education, visitation, counseling, missions, discipleship, children’s ministry, etc. It is NOT for senior pastors. Also, youth ministers and worship/music ministers are holding their own summits separately. Spouses: Yes, spouses are invited. Your congregation needs to make sure any associate staff can attend. So budget some funds and clear their schedules for that week. The meetings will be held at Eastern Hills Wesleyan Church in Buffalo, New York. Pat Jones (right), who is well-known to UBs through his years as a UB pastor and as Director of Healthy Church Ministries, has been senior pastor at Eastern Hills since October 2009. He’ll be the keynote speaker for three sessions. The registration deadline is April 23. We have a guaranteed block of rooms at the Millennium hotel until that date. After April 23, we can’t guarantee that you’ll get a room at the Millennium. Various factors, as given below, affect the registration cost. All per-person costs increase $25 after April 22 (that means a $50 increase for couples). You will be required to present a valid credit card upon check-in for incidentals during your stay. Otherwise, your overnight lodging fees and taxes will be cared for by Healthy Ministry Resources and your full event fee. Dinner on Tuesday night at Niagara Falls. You must bring your passport to cross into Canada. You will be on your own for lunch each day. Honduras Conference held its annual meeting January 16-21, 2012. Superintendent Juanita Chavez (right) sent this report. We are rejoicing in the Lord for the strong representation that we had from our churches at this years conference. We had nearly 300 people present each day. Although Zion Church of Puerto Cortes nearly left the denomination, they have now asked that we send them a pastor. Pastor Neptaly Ponce has been assigned and will soon relocate along with his wife and new baby. In total there were four pastors reassigned at this year’s conference. Four new district superintendents have been appointed. None have been part of our administration before, but are outstanding young leaders who are acting quite responsibly. 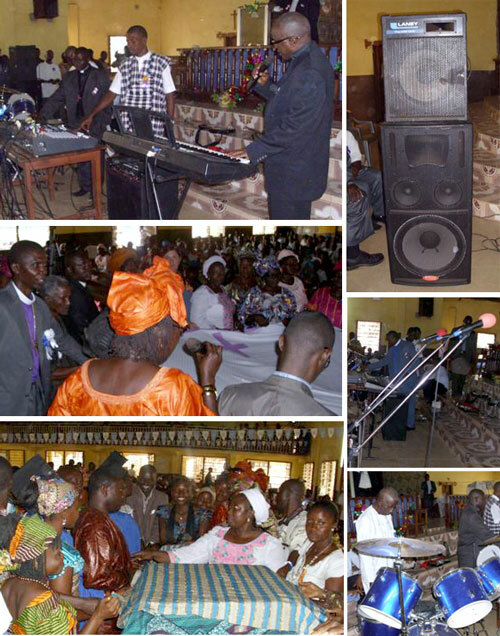 Five pastors were ordained–four men and one woman. The church plant in El Chaparral was officially received and a pastor has been assigned. We have now officially assigned Pastor Gonzalo Alas to El Salvador only. He no longer divides his time between El Salvador and El Copan in Honduras. We trust this will encourage the growth of the work in El Salvador. We have two feeding programs providing nutritious meals to more than 200 children through Mercy Ministries and our United Brethren in the United States. On March 10, 2012, we’ll have the first meeting of the Combehul Cooperative. The leadership team of Honduras has approved the construction of a retreat center on the Maria River. The goal is to develop a self-sustaining ministry that will benefit ministry to youth in this area. We continue training pastors and leaders regarding stewardship using a program called Total Stewardship. During the first week of March, we will launch a church-based theological program. We’ll be offering four-week intensives each month in various districts. Abdiel Lopez of Guatemala continues to offer seminars and training in the integration of scripture in ministry for pastors and leaders. We were blessed to send out 10 teenagers for 33 days of intense missions training with Teen Missions. It was a wonderful experience. These young people have returned with a renewed commitment to the Lord and his work. They have also been awakened to consider becoming missionaries. We continue to thank the Lord for the short-term teams that come to Honduras and especially the medical team that will be arriving in the coming months. As a young boy, Andrew Martin grew up watching “VeggieTales.” Who would have known the lessons taught by Bob the Tomato and Larry the Cucumber would one day leave an impression both morally and occupationally on him. Early on, he wondered how these movies were made and how the characters were brought to life. He did some research and taught himself the mechanics and functionality of computers. 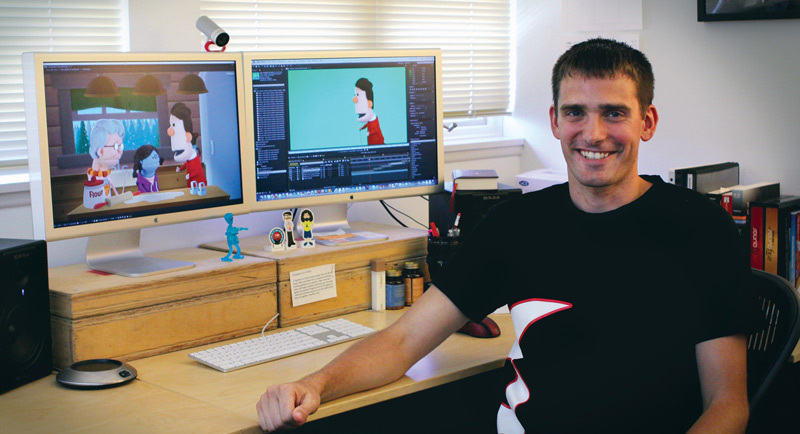 His studies at Huntington University as an animation and computer science major then gave him the technical skills and the means to succeed in the field. Now, he works at DreamWorks Animation SKG Inc. as a technician resource administrator, also known as a render wrangler. Animators send him their animations, and Martin, alongside the rest of the DreamWorks staff, brings those characters to the big screen through a system made up of thousands of computers. Back in June, Martin found the position while browsing through different studio websites. He applied for the job, and then, all he could do was wait. Three weeks later, they asked him to pack his bags and move out to California. And had it not been for the networking with professors, preparation from the HU animation department and the opportunity to conduct his own independent study on render management, Martin does not think he would have landed the position at DreamWorks. During his first day of work, Martin realized the DreamWorks position is the dream job he always wanted.